Tornado here was an F3. The CNN.com headlines today feature the massive and violent storm that has swept across the South. Springtime brings mixed blessings to those of us who live in Tornado Alley which extends from the Gulf of Mexico through the midwest, and amazingly far into Canada where it wraps around north of Toronto to Barrie. In 1985 13 separate tornadoes crossed southern Ontario, killing 12 people, injuring 224 and causing millions of dollars of damage. This was part of a larger outbreak that spread across Ohio, Pennsylvania, and New York. 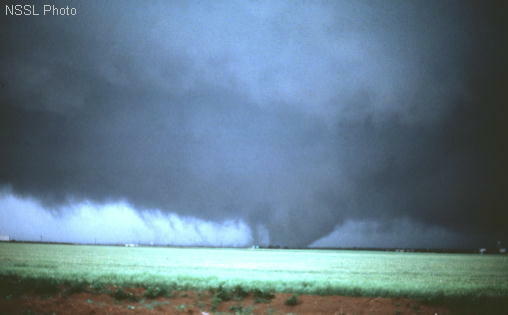 Tornados are rated on the Fujita scale, which has a long history, but now, when it is used at all, it has 5 levels. Level 5 has winds of 300 mph, and the Barrie tornadoes were classified only slightly below this as an F4, "devastating." The original Fujita Scale was replaced in the US by the Enhanced Fujita Scale in 2007. Here's a link to a Wiki article on the Fujita scale. 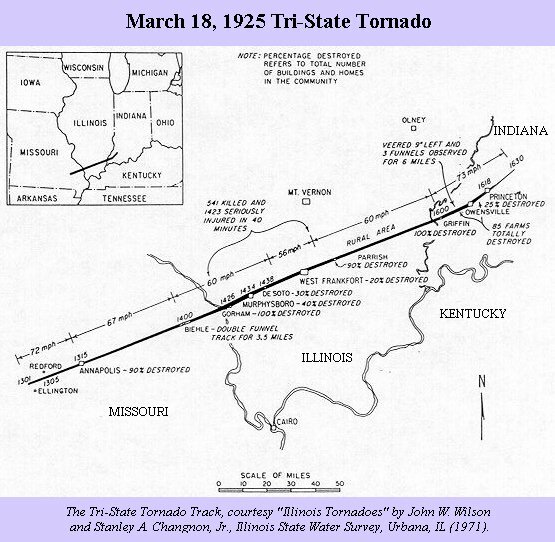 On March 18, 1925, the deadliest tornado in U.S. history raced through parts of Missouri, southern Illinois and Indiana. It was estimated to be an F5, killed 695 people and injured 2027. The path was 219 miles long, with an average path width of 3/4 mile, and it wreaked devastation for 3 1/2 hours. Winds likely exceeded 300 mph. 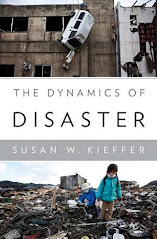 15,000 homes were destroyed. While this current storm was out in Oklahoma, where it did severe damage and killed several people, a team of storm chasers captured it on a video featured in the Washington Post, also posted here on YouTube. 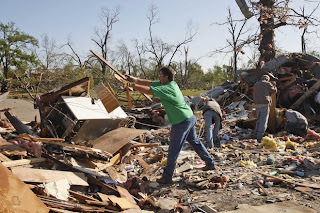 (Note: This is NOT the photo at the left; I don't have access to photos of the recent tornados, only the video referenced.) Most tornadic systems span one, or occasionally two, funnel clouds that touch down, but this one had two prominent ones, and hints of a third and fourth, starting about 1 minute into the video. This is a huge storm, with the spawning cloud being wider than the vertical distance between the ground and the base of the cloud. The smaller tornadoes within the system are known as subvortices, or suction vortices. They spin rapidly within the larger overall circulating winds of the major tornado, and can add over 100 mph to the local ground win. 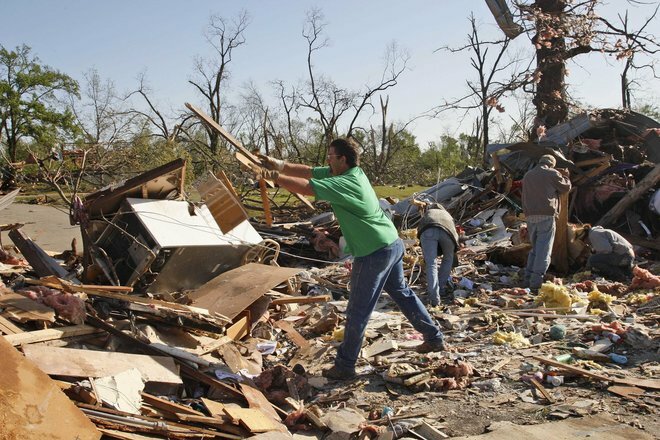 Damage patterns after the passage of one of these systems often consists of a broad zone of weak damage from the main tornado, with narrow strips of strong damage immediately adjacent. This more severe damage is likely caused by the subvortices. 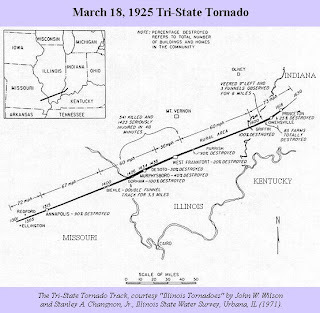 Subvortices are distinguished from "satellite tornados" by their transient nature.